Did you ever dream of playing like Jimi Hendrix? Have you ever wondered how you he came up with so many amazing sounds and guitar licks? One of my all-time favorite online guitar teachers, Marty Schwartz from GuitarJamz.com, recently released a new "Hendrix Revealed" course that teaches some of the techniques and sounds Jimi was able to express through his guitars. Note: This is an intermediate guitar course and Marty teaches all of these modules on an electric guitar. You can certainly translate some of these lessons over to an acoustic guitar, but to really delve into Marty's detailed content, you absolutely should use an electric guitar! 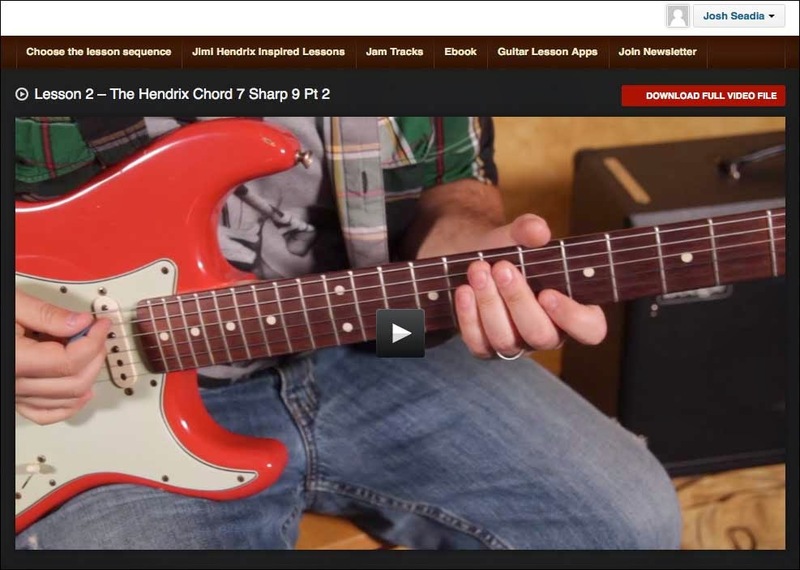 "Hendrix Revealed" contains 26 modules and over 4 hours of step-by-step tutorials! As I mentioned in previous reviews, I purchased Marty's Guitar Coaching Club, so I have been receiving all of his new material. His delivery format has now changed from DVD's received in the mail to immediate online access as a digital download. You can either stream the content or download each module to your computer. This course helped to reinforce my understanding of the CAGED system for guitar, allowing a guitarist to play the same chord but in different places on the guitar fretboard using the C, A, G, E and D chord shapes. For example, in the song "The Wind Cries Mary", you can play the A form chord of D#, E and F for the intro to the song (starting on the 6th fret moving up to the 8th fret). You would then play those same chords using the G form, using your ring finger to hammer on the A string a whole note higher for each chord (starting on the 8th fret moving up to the 10th fret). An unexpected bonus for me was using the "Hendrix Revealed" course to help build up my vocabulary of guitar licks from the E minor pentatonic scale, which is heard so often in popular music. In addition to learning different ways to play chords, Marty spends lots of time with useful techniques such as bending, hammer on's and off's and sliding on the guitar fretboard to help expand your understanding of the Hendrix style. Of course, he also covers the well-known Hendrix Chord (ex: B7#9) and gives some great chord progressions to play and improvise that helps with reinforcing the lessons. Overall, I really enjoyed the "Hendrix Revealed" course from GuitarJamz.com! Both the video and teaching quality were top-notch, and I loved the ability to pause and rewind these videos to make sure I understood the techniques presented. I know it's not an easy process, but Marty has definitely helped me to take control of learning my electric guitar, and I'm looking forward to exploring (and reviewing) more of his guitar courses! If you're a fan of Jimi Hendrix, have access to an electric guitar, and want to increase your overall guitar knowledge, then check out the "Hendrix Revealed" course! Marty makes it fun and breaks these lessons down into manageable pieces showing you the way, step-by-step! Have you purchased Marty's "Hendrix Revealed" Course? What's your feedback on this course or others from GuitarJamz.com? Please share your comments below with our readers!